It’s functional… holds your gardening equipment, tools, feed for livestock, etc. Maybe you converted it into a nice sitting area for adults or a fun playhouse for your kids. Or maybe you created a small greenhouse in it. No matter what you use it for, it’s always nice to spruce it up with a bit of landscaping: it could be your getaway at the end of a hard day at work, or your secret place where you can go play with dirt. Or, it could just be part of your garden, and add to the happy time you spend there. 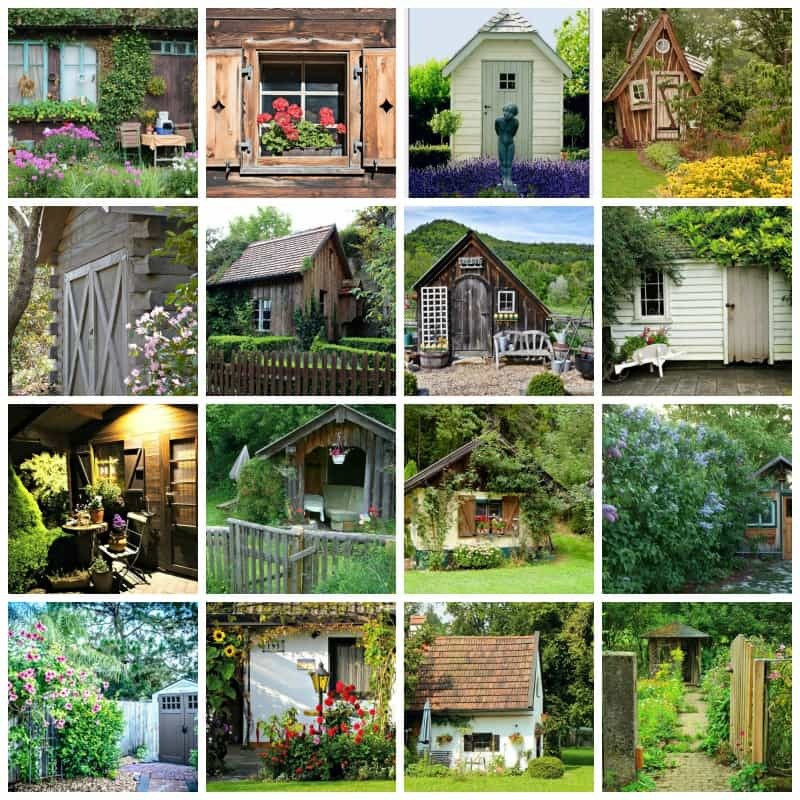 Here are just a few landscaping ideas for sheds to inspire you. Don’t have a shed yet? Build your own with one of these plans. 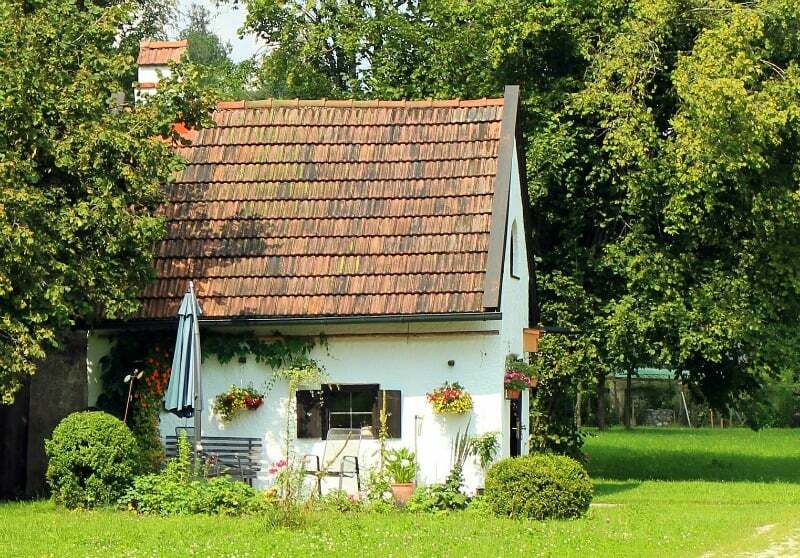 Landscaping around your storage shed doesn’t have to be anything elaborate. Just add a few colorful flowers here, a few pavers there, maybe a few containers filled with your favorite blooms, and you’re done. The first thing that you can do is create a lovely looking walkway to your storage shed. You can do this in a few different ways. WOVTE DIY Walk Maker Concrete Stepping Stone Mold Garden Lawn Pathmate Stone Mold Find some interesting looking larger sized rocks and create a path going to your storage shed. 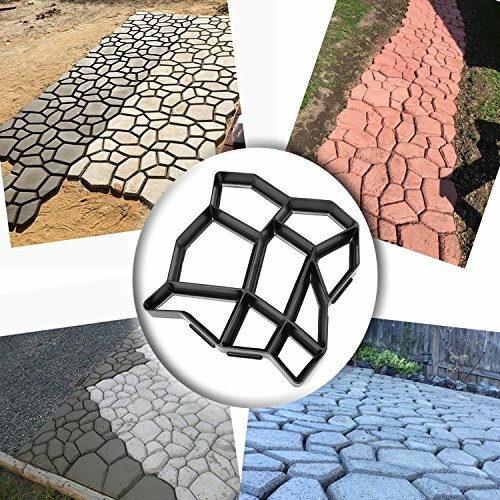 Or, you can create your own walkways design with one of these walkway molds. 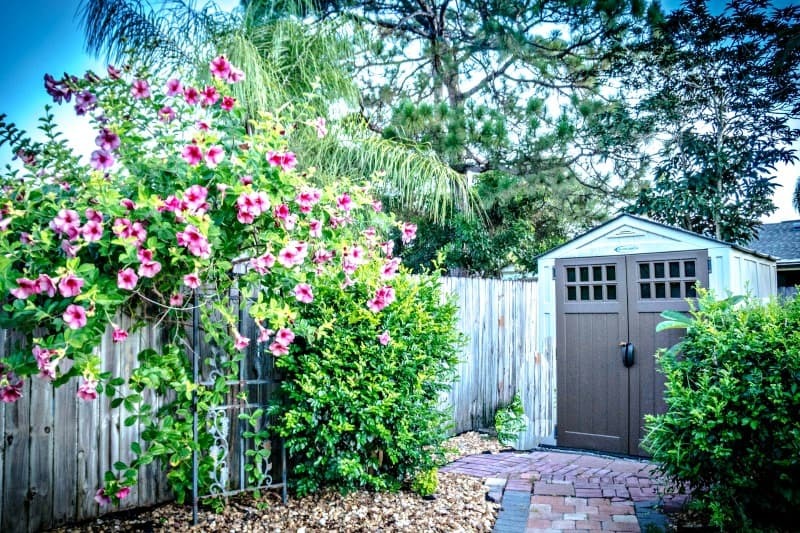 Along the same lines, you can line a path to your storage shed with some pretty colorful flowers. You could plant the flowers right into the ground or you can find some neat looking containers (ceramic planters are beautiful) to plant them in and place along the path. Leave the path between the flowers just dirt, or you could add river rock or even fancy looking wood chips to fill in your path. Another idea would be to get a mold and create some stepping stones to form a walkway to your outdoor storage shed. 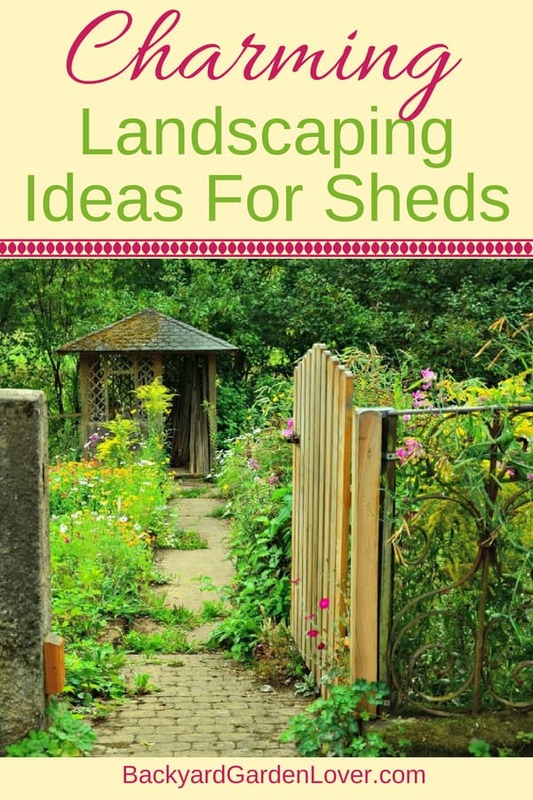 Now that you have some great ideas for creating a nice landscaped path, you can move on to do some landscaping next to your shed. 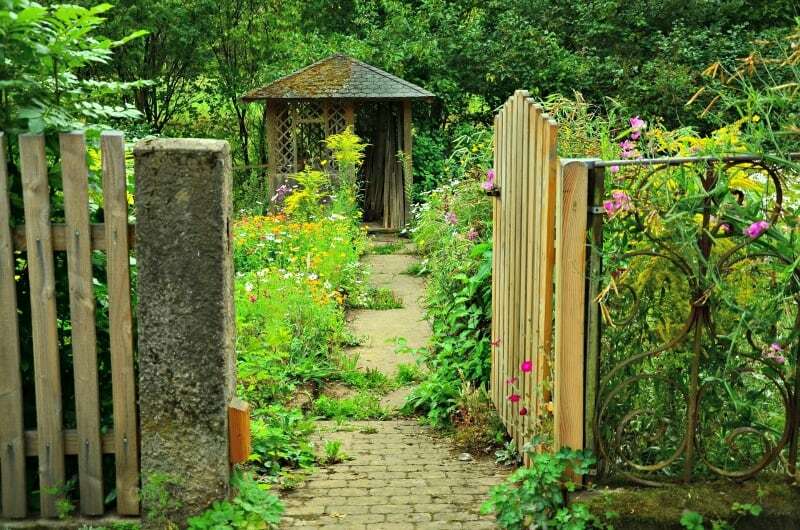 A very simple but pretty way to landscape around your storage shed would be to attach a lattice to both sides of your shed, or by the sides of your path, and plant something that will climb up the lattice. It could be a pretty flowering plant or a very simple vine. I can only imagine a Joseph’s coat rose bush blooming by the side of my shed! If you have turned your storage shed into a playhouse or sitting area, you could purchase some patio brick stone and create a lovely patio area outside of the shed area. Plant flowers all around the patio area, or add some flowers in containers. Adding a pretty set of tables and chairs and an outdoor fireplace will also make a lovely accent. 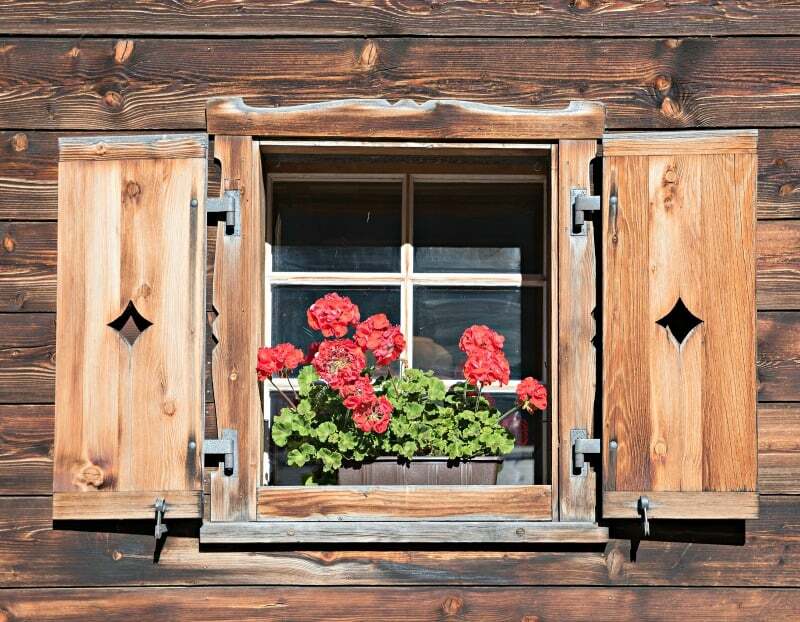 Attach some flower boxes to the windows of your storage sheds and plant some flowers like wave petunias that will provide a fantastic touch of color to your shed. 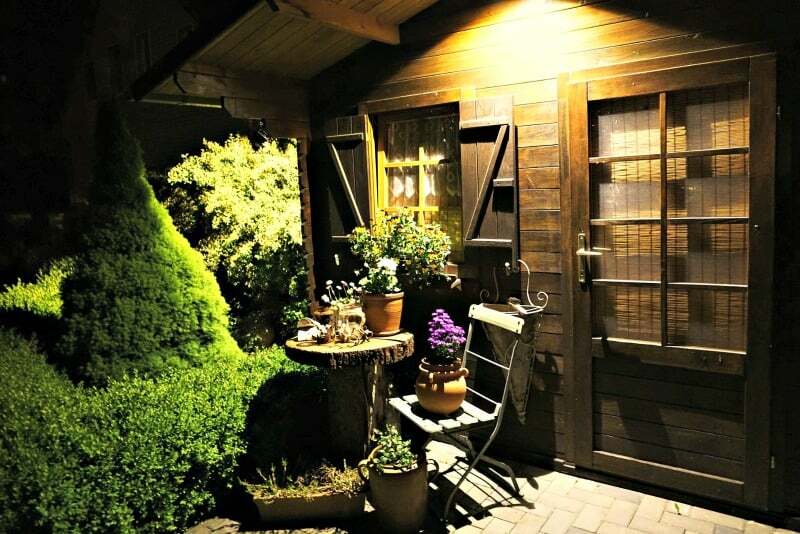 Before you know it you will have a beautifully landscaped storage shed. 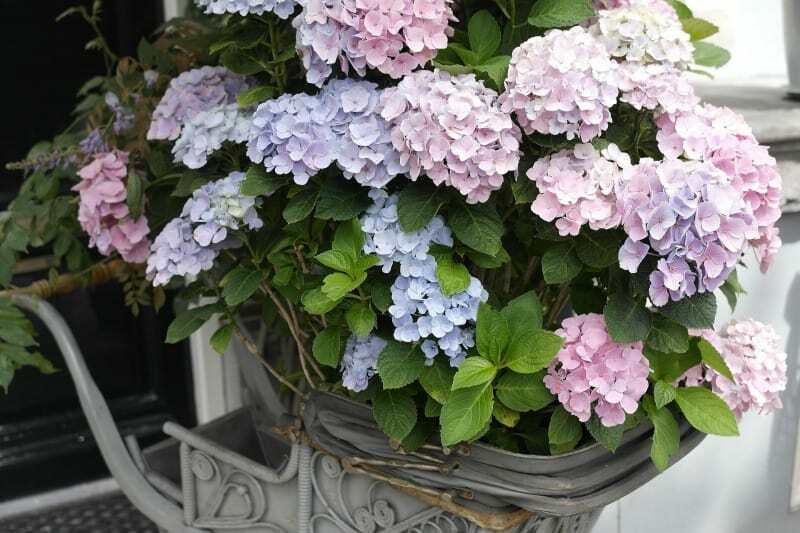 These gorgeous hydrangea flowers, potted in a cute silver sleigh, can greet you every day on your way to the shed. Place them at the door and enjoy them all summer long. BTW, did you know you can control their color with a bit of garden chemistry? 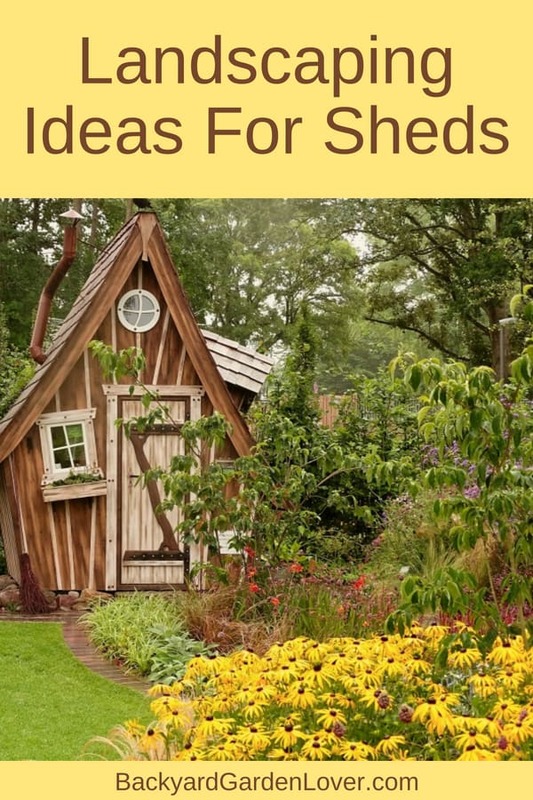 If you need more inspiration about landscaping around sheds, I gathered some pictures of landscaping around sheds for you. Enjoy! 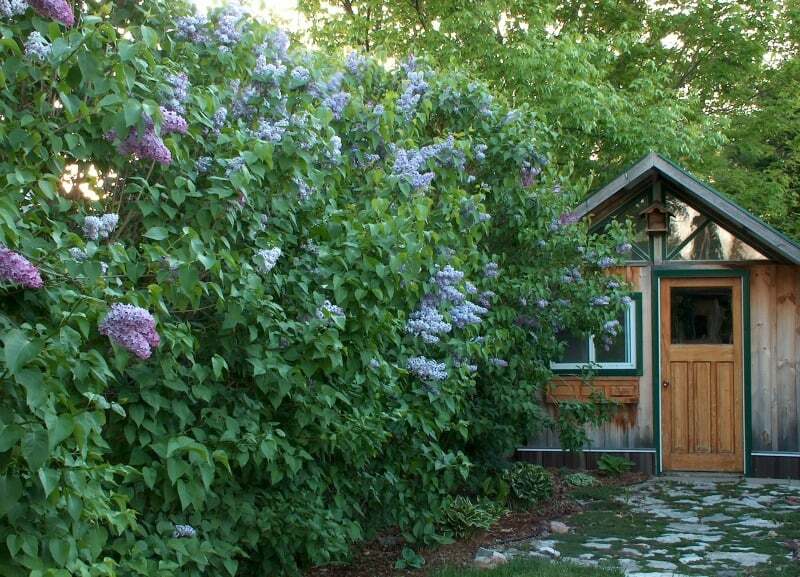 This shed, situated at the back of the backyard is surrounded by gorgeous lilacs. I can only imagine spending my afternoons here with a good book or some friends. 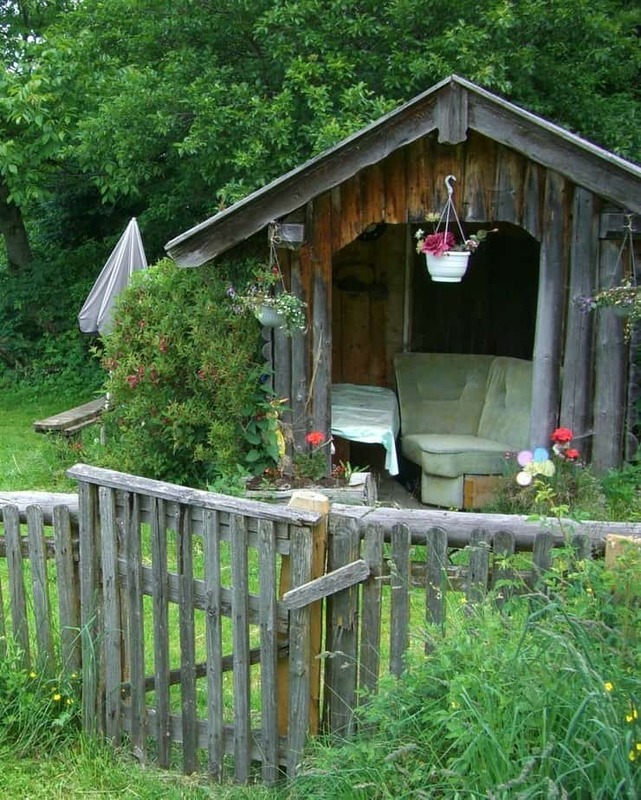 This hidden shed is livened up by a cute wheelbarrow with red and white flowers. Could be a man cave or a she shed: both would love the solitude here. 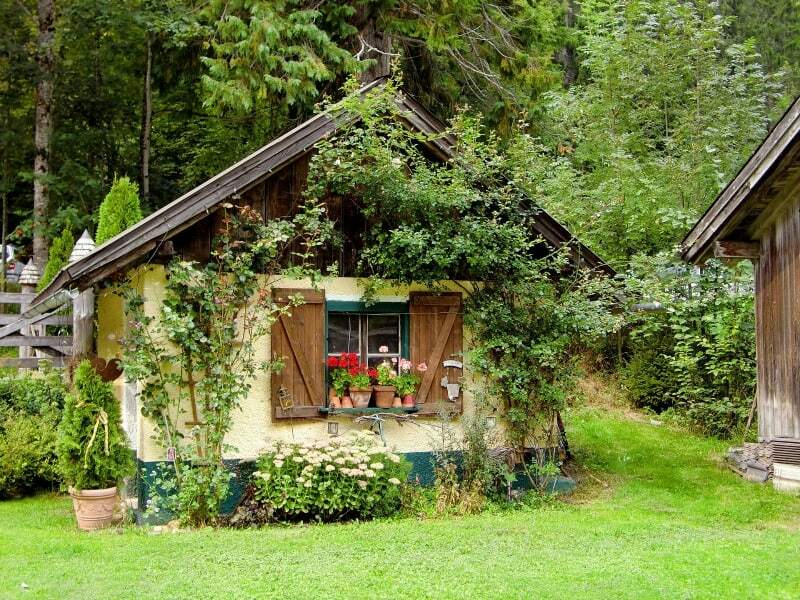 What a cute shed! And I love the conehead flowers: they bring a cheerful atmosphere to this spot. 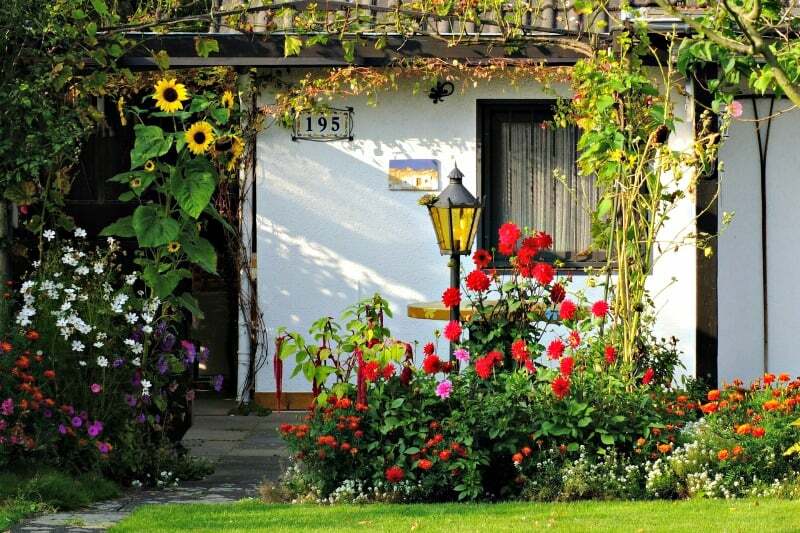 This little home away form home (that’s what it looks to me: I can see my grand-kids wanting to spend the night here for fun) has a bit of everything: some evergreen bushes, a climbing vine and some pots with colorful flowers to cheer you up every time you stop by. 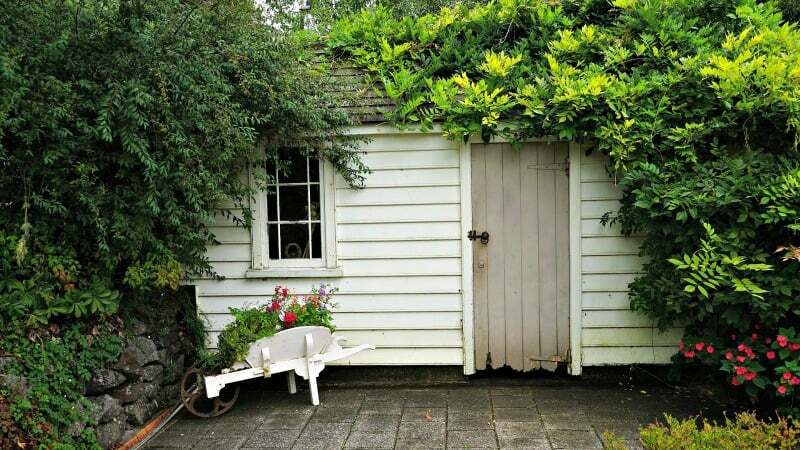 Almost hidden form view by vegetation, this little cottage styled shed is the perfect spot for working on your secret garden projects, or enjoying a good book in the middle of nature. This country shed has a gorgeous view! It has all you need to keep busy in the garden and even preserve your garden harvest! 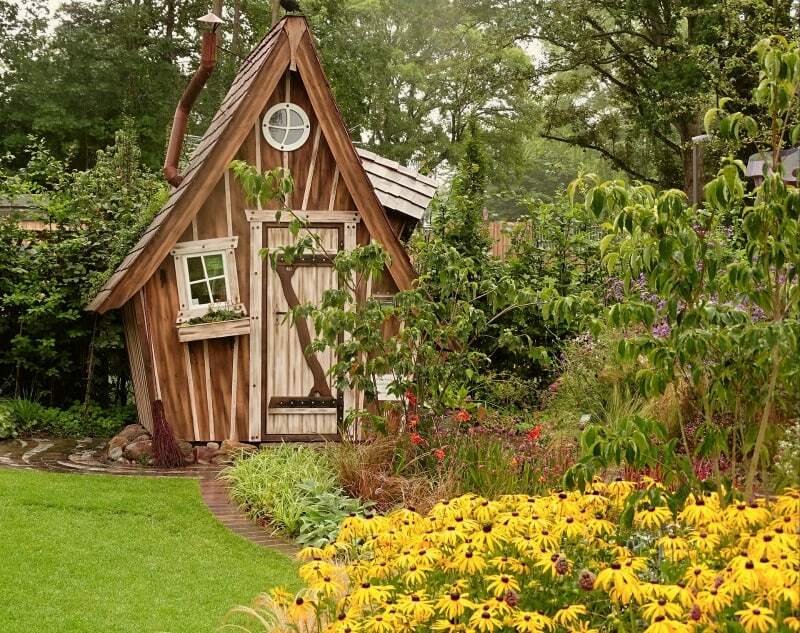 This she-shed is adorable! Surrounded by colorful flowers, it creates the perfect little corner to relax after a hard day at work. The sunflowers make me smile! 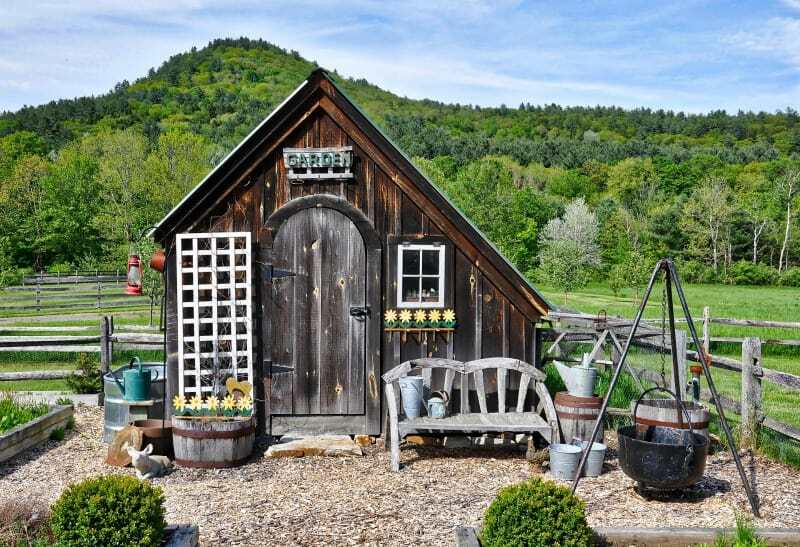 This old shed looks like a favorite nap spot, as you labor in the garden. Take a break and rest a while. Want to build a gazebo? They add charm to any garden and are the perfect place to unwind at the end of the day. 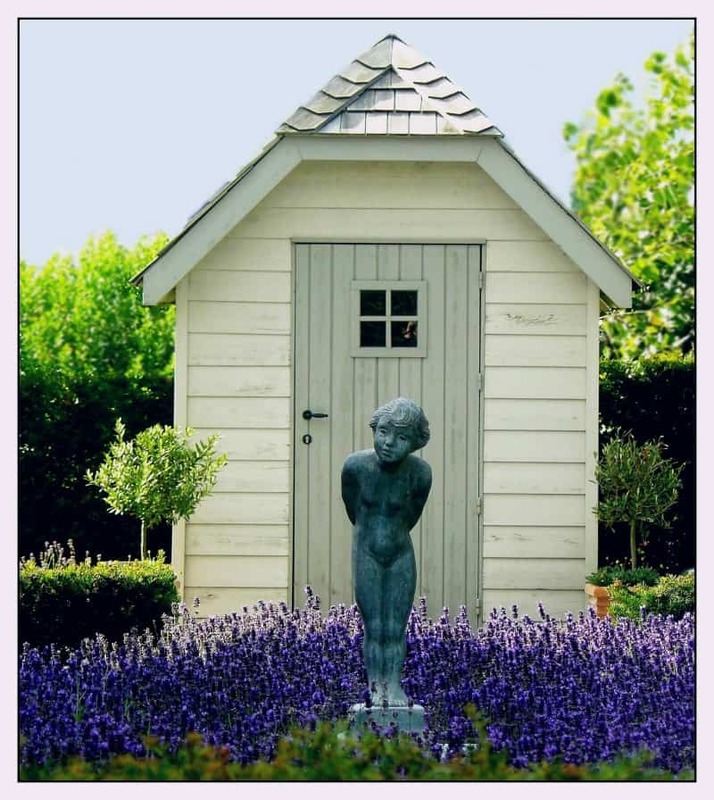 Have a beautifully landscaped shed? I’d love to feature it here. Get in touch here. All great ideas. I have been wondering what to do in this new corner I have in my garden. Thinking the fountain idea just haven’t figured it out yet what all I want to do. Thanks for the ideas!! !